I think I've found my Sole Mate! Remember the time when we were still searching for the perfect partner? 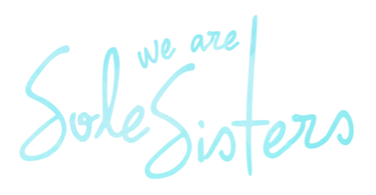 And we eventually did. We got our first 45L North Face Terra backpacks through R.O.X. and took those babies for a spin around Asia for 6 months. But after our homecoming, I realized how I can actually survive with much less on my back. 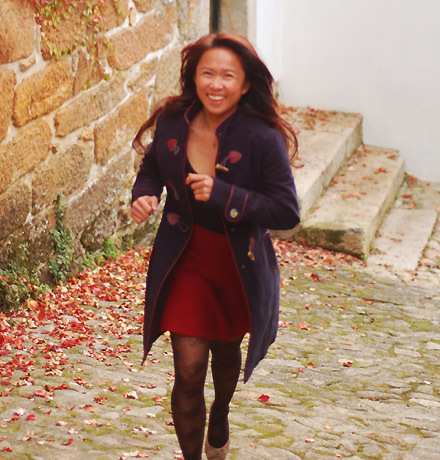 The moment I saw the Tri Star travel bag by Tom Bihn on Pinay on the Move's site, I was smitten! I knew I had found my perfect sole mate! You're probably thinking: "Seriously? How excited can you really get about a piece of luggage?" Very excited as a matter of fact! I wanted him so badly I drooled on my computer screen for weeks hoping to have him as my very own. I tried joining Pinay on the Move's giveaway, but didn't get lucky that time. I just had to email them to make my wish come true. And it did. 1 He's very cool and stylish. I requested for the Steel Solar bag and I just love the contrast of the colors that peek through the insides. 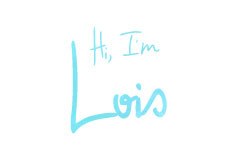 And he's beautifully hand-made with rich materials. The stitching is so perfect- he's a work of art! Sure, he's no grungy backpacker's companion. But for a few weeks of business or pleasure travel, he's The One! 2 He's eye candy. A lot of people have stopped me to ask where I got my bag. Tom is not only stylish, he's an eye catcher. He's quite a rarity in the luggage world- for his size and design, people easily take notice. 3 He makes room for me. 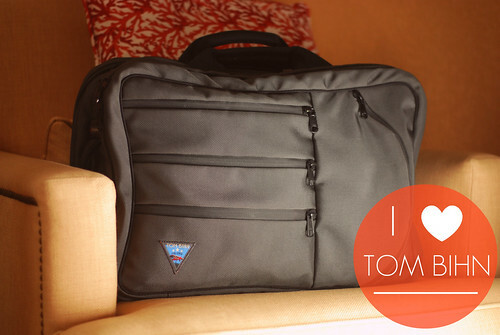 Tom has 3 main compartments: 1) the front for your kikay kit and shoes; 2) the middle for your laptop, camera and even your gibson 500t, for my musically inclined friends 3) a rear for your clothes that won't wrinkle with tie down straps. The front of the Tri-Star features four zippered pockets which consist of a curved zipper with a safety flap that could hold your cellphone or travel documents. I used the other three horizontal zippered pockets to hold my long haul flight survival kit (more on this in another post), sunglasses and wallet that you can attach to a key holder in the middle pouch. I can fit my life into this bag! 4 He thinks of my comfort. When I first tried Tom as a shoulder bag, I was surprised at the comfort. I then realized that the strap was made of an elastic, flexible material that stretched and bounced with me as I moved. The handles are made of Poron-foam pads which makes them easy to carry around. 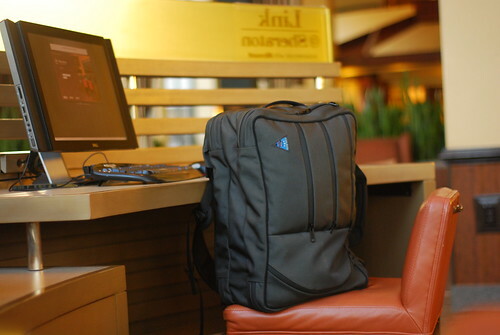 As a backpack, the weight is evenly divided and the smooth texture of the material makes it back-friendly. 5 He's very adaptable and versatile. You can use it as shoulder bag or backpack (with hidden straps). The backpack straps are padded and contoured and feature a removable sternum strap and an optional removable waist strap to help distribute weight and stabilize the bag to your body. And in case you get caught in unfriendly weather, the fabric is treated to be water-resistant and comes with #8 YKK splash-proof Uretek zippers to keep the weather outside where it belongs. 6 He's always concerned for my safety. The bag is lined with ultra-light custom-made Dyneema/nylon rip-stop fabric that is extremely tough. The front contains a subtle-but-clever curved zipper pocket to contain items that you don't want to slip out accidentally or get snatched quickly. 7 Together, we rule the skies! If you're just like me who would rather have all her stuff accessible during long flights, this is the perfect bag. Tom fits perfectly in the overhead bin and even under the plane seat. Its overall dimensions are : 19″ x 13″ x 8″ / 480 x 330 x 205mm. 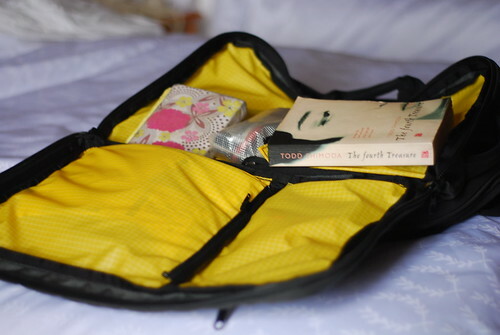 I can grab my laptop, book, journal or long haul flight survival kit at anytime during the flight! 8 He's accessible. 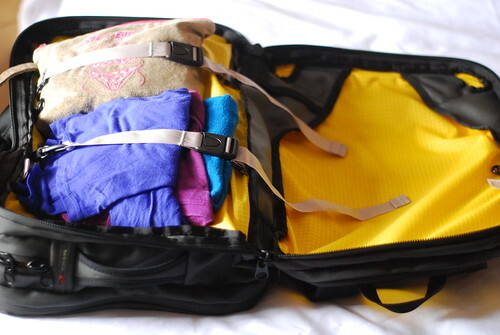 Both the left and right ends of the bag have padded grab handles that allow you to easily grab and pull your bag out of the overhead compartment. 9 He's smart. How clever is it to own a bag that comes with its own Brain Cell! When I requested the Tri-Star, they asked me what size and make was my netbook. They fitted a custom-made Brain Cell laptop case that provides superior laptop protection with a corrugated plastic insert, a soft, brushed-foam interior, suspension system, and memory foam bottom. The Brain Cell can be unclipped from the Tri-Star and used on its own which makes it perfect for airport checks. A bag with independence- he stands on his own! 10 He can hold its own. Empty or packed, the Tri-Star it will continue to stand up on its own. The stitching and the black piping helps the bag stay in shape and upright. No relationship is perfect. Same thing for Tom and I. Here are 3 things I still find lacking in most men bags. 1 He brings me down. Because of the tough material and Brain Cell, the Tri-Star tends to be on the heavy side. 2 He's a shape-shifter. Because it's rectangular, the contents need to be arranged properly to maintain the bag's shape. The material is also a bit soft which makes the back lumpy when you've been carrying it for a while or didn't pack properly. 3 He's no cheap date. Tom comes with a hefty $270 USD price tag- certainly not cheap for a travel bag. But with the labor, superior material and well-thought out design that comes with it, you can understand why! Tom and I are so compatible that I can overlook the 3 things I don't like so much about him. 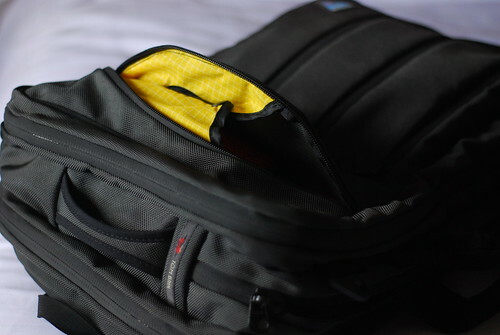 For my travel style, he's the best one-bag solution- spacious enough to fit the necessities and organized enough that I can literally live out of a suitcase! And very comfortably if I may add. Admittedly, I’ve been through quite a few men bags since I started traveling extensively 4 years ago. Some of them have been acquired on impulse or hand me downs. And as you may know, relationships like that can never last long. Some had been exhaustively researched and deemed as investments. But somewhere along way, I've felt shortchanged when their performance turned out to be unimpressive. This time, I've found a keeper. Could he also be The One for you? 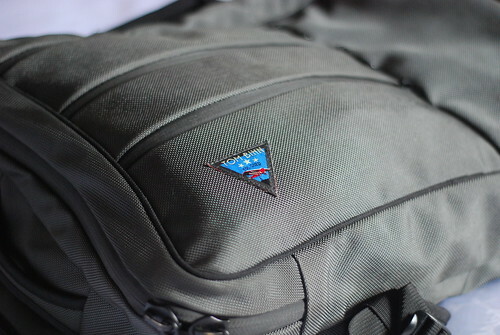 Note: The Tri-Star Travel Bag was provided by Tom Bihn, a local company in Seattle, Washington. As always, review and opinion are my own. 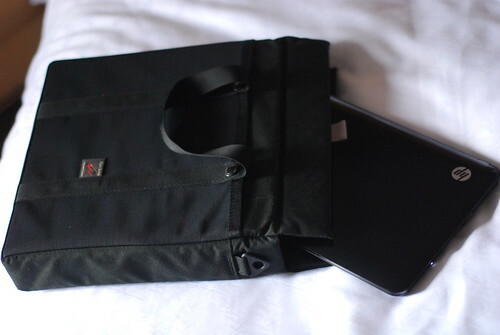 Cuz can you bring home 1 for me.. it will also be easier for me to travel with this bag..
Love your review. Tom is a total ladies man. :) The only thing I wish he had was wheels!